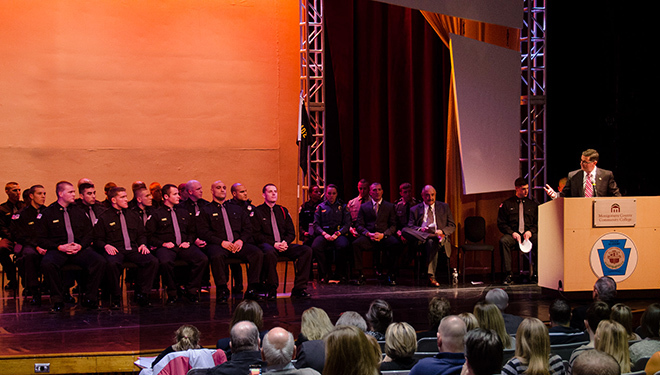 Thirty-five cadets graduated from Montgomery County Community College’s Municipal Police Academy last month during a ceremony held at the College’s Science Center Theater, 340 Dekalb Pike, Blue Bell. The ceremony began with a moment of silence in memory of Plymouth Township Police Officer Bradley Fox, who was killed in the line of duty on Sept. 13, 2012. Fox was a graduate from academy class 603. Retired Pennsylvania State Police Lieutenant Michael Ford, a Vietnam veteran and instructor at the academy, was selected by class 1204 to give the keynote address. “There’s a reason [academy] instructors come back to teach year after year. [The cadets] are a part of what I do – my legacy. I want them to be the best they can possibly be and make me proud,” he said. Montgomery County Commissioner Bruce L. Castor Jr. and Montgomery County Chief of Detectives Edward Justice also attended the ceremony, along with representatives from Lower Merion, Quakertown, Upper Darby and Abington police departments. 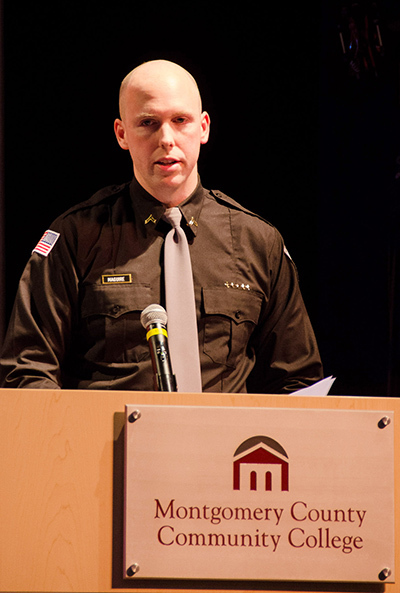 As valedictorian, Cadet Dwight Kondravy, Philadelphia, offered remarks on behalf of his fellow graduates. Other honors presented during the ceremony included the Leadership Award to Cadet Lieutenant Kevin Saffell, Norristown, and the Spirit of Distinction Award to Cadet Sergeant Richard Lewis, Willow Grove. Academy Director Frank Williar presented the Director’s Teamwork Achievement Award to Cadet Corporal Brenna Stemler, Hatboro. This new award recognizes a cadet who best exemplifies the concept of team over self. Williar also presented the class 1204 guidon to George William Hallahan, West Chester. The class flag is occasionally presented to a graduating cadet who overcomes the greatest number of challenges to succeed. Two cadets, Timothy Miller, of Upper Darby, and Edward Sarama, of Galloway, N.J., achieved perfect scores on the range, earning them the Sgt. James R. Miller Marksmanship Award. The award is presented in memory of Upper Dublin Police Sergeant Jim Miller, who died in an automobile accident while on duty in 2004. Additionally, Ryan Bunda, of Bristol, was presented with the Chief John J. McGowan III Memorial Scholarship. The $2,500 scholarship honors former East Norriton Police Chief John McGowan, who was killed in a fatal motorcycle accident in June 18, 2010. Cadets from class 1204 attended the academy full time, Monday through Friday for 22 weeks. Graduates include Ryan Bunda, Bristol; Joseph Cantymagli, Pottstown; Sean Clements, Bensalem; Jack Davis, Towamencin; Matthew Dougherty, Media; Ronald Ernst, Newtown; Samantha Grebe, Lansdale, G. William Hallahan, West Chester; Brandon Hertzog, Lansdale; Paul Houseknecht, East Greenville; Tyrone Johnson, Penllyn; Kyle Knowles, Levittown; Dwight Kondravy, Philadelphia; Jonathan Kramer, Perkasie; Richard Lewis, Willow Grove; Matthew Lynch, Upper Darby; Matthew MacNeal, Glenolden; Robert Maier, Skippack; Timothy Miller, Upper Darby; Ryan Paskel, Bridgeport; John Prestia, Plymouth Meeting; James Robb, Pottstown; Timothy Romanek, Levittown; Kevin Saffell, Norristown; Edward Sarama, Galloway, N.J.; Matthew Stead, Schwenksville; Breanna Stemler, Hatboro; Will Suren, Philadelphia; John Wade, Bristol; Jeff Ward, Warminister; Madeline Welsh, Phoenixville; Paul Welsh, Roslyn; and Robert Whitt, Hopewell, N.J. The academy has been the training ground for approximately 3,400 cadets with a consistent graduation rate of more than 90 percent. The 800-hour curriculum allows successful students to articulate up to 15 credit hours toward an associate’s degree in Criminal Justice. In 2010, what Alex Bruckner needed was a little flexibility. That year, the 25-year-old Eagleville resident had just been discharged from the U.S. Army after two tours of duty. He was enrolled in the Montgomery County Police Academy where he was assigned the rank of lieutenant (class leader). He was hired as a full-time police officer, and he got married. “I’ve had a lot on my plate,” Brucker said. Bruckner graduated in May from Montgomery County Community College’s Criminal Justice program. Bruckner benefitted from the Post-9/11 GI Bill, but would have considered Montgomery County Community College a bargain without it. “I would say that $300 to $400 for a college class is very affordable, and if the GI Bill was not available, MCCC still would have been my first choice,” he said. After serving two tours in Iraq in a unit tasked with addressing IEDs (improvised explosive devices), he enrolled in the Criminal Justice Program at MCCC. After living history, Brucker enjoyed studying it. “I would say the most important experience I had at the college was being a student of Professor James Robertson and Dr. [Daniel] Rolph who were very knowledgeable history teachers,” Bruckner said. With his career as a Montgomery County police officer already under way, he’s not sure if additional education is in the cards. “One thing that I have realized in our current economic state is that just having a degree doesn’t pay the bills or get you a job. You need to be creative and motivated to pave your own way instead of relying on a piece of paper to do it for you,” he shared. 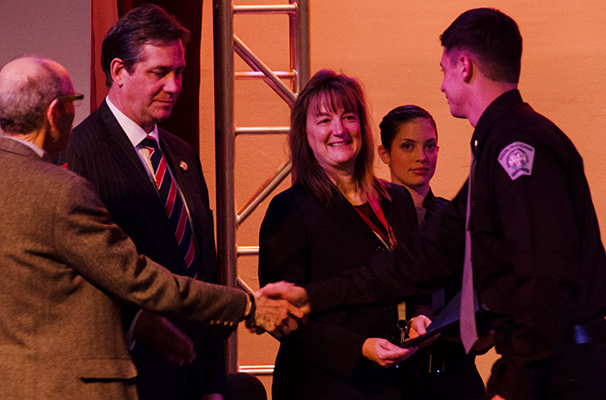 Thirty-three police cadets graduated from Montgomery County Community College’s Municipal Police Academy on March 21 during a ceremony held at the College’s Science Center Theater, Central Campus, Blue Bell. The graduates of Class 1104 included Chad Archer (Gilbertsville), Sgt. Joe Augustine (Chichester), Joe Bohrer (Cheltenham), Andrew Cikanovich (Conshohocken), Daniel Crozier (Levittown), Sgt. Jonathan Ezzo (Blue Bell), Ray Finizio (Maple Shade, N.J.), Richard Gensler (Holland), John Gibson (Doylestown), Kimberly Giovinco (Norristown), Zachary Goetter (Lansdale), Christian Hamilton (Phoenixville), Stephen Hershey (Collegeville), Arthur Hirsch (Croydon), Sgt. John Horgan (Lansdale), Carolyn Hunt (Havertown), Lt. Christopher Johnson (Ambler), Paul Johnson (Warminster), Corey Maitz (Doylestown), Eric Mercer (North Wales), SSgt. Andrew Monaghan (Hatfield), SSgt. Cliff Prescott (Ardmore), Cpl. Maureen Rae (Jenkintown), John Rappold (Honeybrook), Sara Rouse (Bristol), Cpl. John Rushin (Mt. Pocono), Matthew Ryan (Cazenovia, N.Y.), Nathan Scott (Royersford), Anthony Shearer (Port Royal), Shayne Smith (Norristown), Andrew Summers (Perkasie), Cpl. Nick Virnelson (Quakertown), and Gary Zumpano (Horsham). Cadet Richard Gensler was named Valedictorian, Lt. Christopher Johnson earned the Leadership Award and Cpl. John Rushin earned the Sgt. James R. Miller Marksmanship award. Sgt. John Horgan was recognized with the Spirit of Distinction Award for his teamwork, discipline, dedication and leadership. 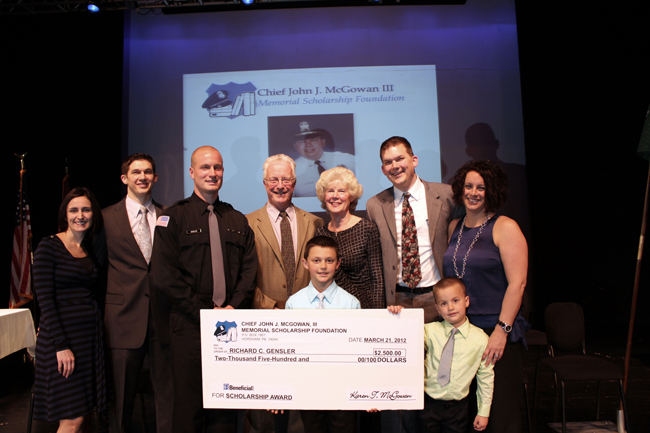 During the ceremony, the McGowan family presented the first Chief John J. McGowan III Memorial Scholarship in the amount of $2,500 to Richard Gensler. “You set the bar high,” said John J. McGowan IV, about Gensler’s application essay, which describes how he wants to protect and serve the community as a police officer. Widow Karen McGowan, accompanied by her son Scott McGowan and his wife Malissa, and son John McGowan IV and his wife Kimberly with their sons Jack and Finn, was pleased to award the scholarship. Chief McGowan started his law enforcement career in 1974 with the Lower Moreland Police Department. While working there, he graduated from the FBI National Academy and earned his master’s degree in Criminal Justice from St. Joseph’s University. After his retirement in 1992, he became the police chief and public safety director for East Norriton Township, a position he held until June 18, 2010, when he was involved in a fatal motorcycle accident. The ceremony also featured guest speakers 2011 Academy graduate Emily J. Hopkins and FBI Special Agent/Academy Instructor Scott Duffy. Newly appointed Chief County Detective Edmund H. Justice of Montgomery County was also in attendance. Both Academy Director Frank A. Williar and Deputy Director Charles O. Pritchett praised Class 1104 for their teamwork, dedication and overall stellar performance. The Academy has been the training ground for approximately 3,100 cadets with a consistent graduation rate of more than 96 percent. The 800-hour curriculum allows successful students to articulate up to 15 credit hours toward an associate’s degree in Criminal Justice. Twenty-three police cadets graduated from Montgomery County Community College’s Municipal Police Academy on Nov. 16 during a ceremony held at the College’s Science Center Theater, Blue Bell. The graduates of Class 1102 included Jason Aduddell (Ardmore), Micah Albert (Souderton), Devon Beer (Doylestown), Dawn Marie Cabrera (Roslyn), Robert Daniello (Yardley), Jason Daye (Telford), Christopher Dolan (Bensalem), Matthew Duross (Willow Grove), Edward Dvorak (Harleysville), Justin Grotz (Fairless Hill), Emily Hopkins (Philadelphia), Brian Hyams (Philadelphia), Anthony Matteo (Hatboro), Alex Moldavskiy (Philadelphia), Chris Pennington (Holland), Matthew Rychlak (Malvern), David Sangree (Hatboro), Timothy Sebenick (Hatboro), Matthew Trznadel (Royersford), Michael Urban (Doylestown), Alicia VanArsdale (Flourtown), Matthew Walsh (Philadelphia) and Mark Zakrzewski (Philadelphia). Cadet Jason Daye was named Valedictorian, Lt. Micah Albert earned the Leadership Award and Cadet Jason Aduddell earned the Sgt. James R. Miller Marksmanship award. Sgt. Brian Hyams was recognized with the Spirit of Distinction Award for his determination, personality and initiative. During his address to the class, Daye acknowledged that the program was challenging physically and mentally, but that the class performed well. Montgomery County Commissioner Bruce L. Castor Jr. and Montgomery County Deputy Chief County Detective Samuel J. Gallen attended the ceremony. 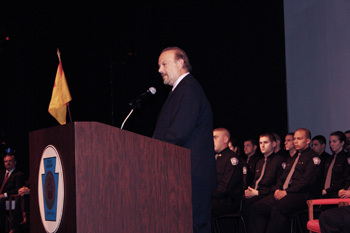 The keynote speaker was District Justice Paul N. Leo of the 38th District, who also teaches at the Police Academy. Justice Leo told the cadets that a law enforcement career is like a dangerous game in which they would face numerous stumbling blocks, challenges and dead ends, as they tried to apprehend criminals, but they would persevere and rise above those difficulties. Valedictorian Jason Daye addresses his fellow graduates.